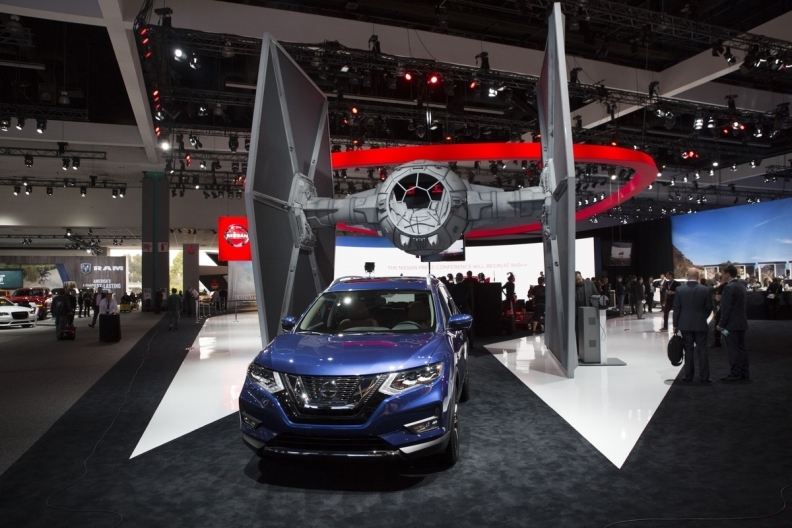 A TIE fighter lords over Nissan's Los Angeles auto show display in November. Going rogue doesn't mean going solo. That was the thinking behind Nissan's promotional tie-in with the newest Star Wars film, which finally opens nationwide in Canada on Dec. 16 after an eight-month buildup. The partnership, announced in August, began with a little serendipity. The name of Nissan's top-selling Canadian model, the Rogue compact crossover. Through the first 11 months of 2015, Nissan has sold 36,884 units in Canada, up 11 per cent over last year. The Rogue accounts for more than half the combined total of 68,051 trucks and SUVs Nissan has sold in Canada this year. It's also Nissan's top-selling model in the United States. The vehicle's name just happened to be embedded in the movie's title, Rogue One: A Star Wars Story. The timing of the film's release roughly coincided with the arrival of a face-lifted 2017 model, and both were aimed at family audiences. Those links opened the door, says Nissan North America marketing chief Jeremy Tucker. But to make the partnership and promotion work -- that is, to actually sell vehicles -- would require a much heavier lift. And that's where the dealers came in. Like Nissan's marketing brass, the dealers wanted to use the blockbuster relationship to push the safety technologies of the Rogue. So Nissan formed a team of six dealers from its marketing subcommittee to provide insight on how to make the most of one of its highest-profile marketing forays to date. Members of the elite team, dubbed the Dealer 6, were immersed in each level of the campaign, from the Tier 1 and Tier 2 TV ad strategy to the digital executions and the activities within stores. They advised the automaker about the creative direction and execution of the campaign's elements, while ensuring that communication with the dealer network flowed smoothly at every stage. Jeremy Tucker with a helmet that comes with the special Rogue. In exchange for their cooperation, the dealers received a treat: an invitation to the film's glitzy Hollywood premiere a week ahead of the theatrical release. The dealers more than earned their prize, Tucker said. "They met with us every single week to go through and build this and make sure we're building it right for the customer, building it right for the brand and building it right for the dealer," Tucker told Automotive News. "I've never seen dealer engagement like this." A year earlier, it was Fiat Chrysler that sought to capitalize on the reawakening of the Star Wars franchise for a new generation of moviegoers. With Star Wars: The Force Awakens, FCA opted to confine its promotional efforts to Tier 2 -- the regional dealer groups -- reasoning that Star Wars mania was too big for any one brand or model. A few special-edition cars were displayed, but they were never marketed to consumers. Nissan, by contrast, has held nothing back since announcing its partnership in August with Lucasfilm, the Disney-owned movie studio behind the Star Wars franchise. The brand crafted six Star Wars-themed spots around the Rogue in addition to digital outreach and memorabilia giveaways at dealerships. The campaign began on Halloween and runs through early January. There's also a limited-edition Rogue model with Star Wars badging -- the first production vehicle that Lucasfilm has ever sanctioned. (Each one comes with a replica Death Trooper helmet.) Nissan is making 5,000 of the specially badged Rogues available in the U.S. and 400 in Canada. Tucker, who joined Nissan from Disney in 2014, said its alignment with Lucasfilm was a true partnership. The film studio, for example, enlisted its special-effects company, Industrial Light & Magic, to handle the visual tricks and music for Nissan's advertisements. ILM also put together a virtual-reality teaser for Nissan's Los Angeles Auto Show setup that demonstrated the Rogue's safety technologies. Tucker said the full experience launches this spring. "It started as a name," Tucker recalled, "but once we actually did some digging, we realized this was much, much more than that." Lucasfilm came through with its largest surprise two weeks before the Los Angeles show. Tucker got a call from Lucasfilm on a Friday night asking if he'd like a life-size fan-built TIE fighter plane for the Nissan display. The fictional battle craft of the Galactic Empire was at Lucasfilm's London studio and ready to be shipped. Tucker gladly accepted the offer, which he said was a case of Lucasfilm going above and beyond the contract. At Nissan's stand in L.A., where the special-edition Rogue was unveiled, the TIE fighter lorded over a display that also showcased Stormtrooper and rebel costumes, along with an augmented-reality kiosk that places people in a virtual battle test simulator with the Rogue. But getting the promotional effort to connect with consumers began well before the show, with dealers involved at every step. The dealers reviewed creative concepts, gave feedback on tag lines and met with TBWA/Chiat/Day -- Nissan's ad agency -- to go over media placement. The dealers championed the idea of showing the ads in movie theaters and helped Nissan devise a plan to give away Death Trooper key chains to consumers at stores. Nissan took advantage of what the dealers were seeing to help shape the TV spots. "Based upon their interaction with the consumer, especially when it came to safety, they were able to talk to us," Tucker said of the dealer input on ad topics. The dealers were saying, ""These are the things I'm selling against and I'm finding traction with the customers.' They helped to make sure we had the right features and benefits" in the ads. The Dealer 6 even helped Nissan determine how many of the limited-edition models to build. One of the Dealer 6, Wayne Siegel, described the Nissan collaboration as a "Kumbaya moment." 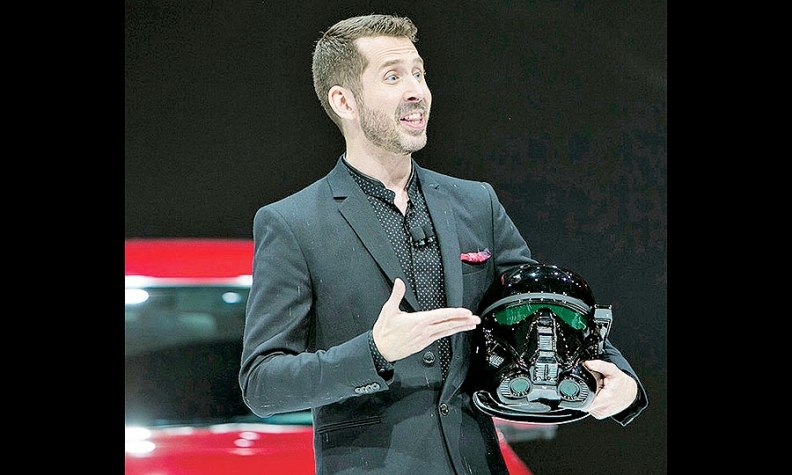 At one point, he said, Nissan presented the team with an array of promotional items to consider such as Stormtrooper cardboard cutouts for showrooms. But Siegel said the Dealer 6 didn't want stores to have to buy one big kit only to use a few of the pieces while others go to waste. So the dealers asked if Nissan could offer stores different kit levels to choose from. Nissan immediately agreed. Siegel, a dealer principal at Legend Nissan in Syosset, N.Y., said the campaign's planning moved quickly. "Think about what happened in a short period of time -- four, five, six months," Siegel told Automotive News. "We got a limited-edition car into production, we got all of these point-of-purchase kits going on, we've got dealer engagement, we had all the creative for the advertising to go on. "Whatever the boxes were that needed to be checked, we checked all the boxes," he said. Siegel said last week that he planned to attend the Hollywood premiere with his daughter. The Dealer 6 were "floored" by the invites, he said. An important cog in the Rogue One campaign was communicating each step to the dealer network. Tucker said the Dealer 6 ensured that stores weren't inundated with information. Instead of putting out a lengthy master plan around the promotion, the Dealer 6 influenced Nissan to send tidbits of information when appropriate. The automaker sent tips each week letting stores know what the brand was doing on social media that week, or when to look out for the promotions on TV. Earlier this month, for instance, a Rogue was given away to a family on "The Ellen DeGeneres Show." "The dealer team pushed us and challenged us," Tucker said. "They helped us think about and define the brand."